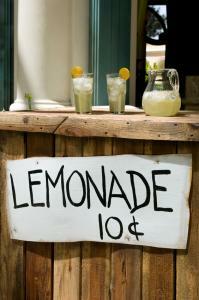 For many children, setting up shop to sell lemonade to passersby is a routine summer activity to raise pocket change. Many have even committed to use the funds to help eradicate nefarious diseases like cancer or to support other charitable causes. However, depending where you live, this seemingly innocent and altruistic activity could cost parents big time if you don't follow the proper procedures. That's because some states have laws on the books that prohibit traditional neighborhood lemonade stands without a permit and other pre-approval hoops. There's even more cause for concern if you have cantankerous neighbors to rat you out. Just ask comedian Jerry Seinfeld, whose sons were trying to raise funds for charity last summer and had their lemonade stand shuttered by police after a neighbor complained. Some people are just nuts. As community banks know so well, small businesses that rely on funding for their ongoing operations also face multiple challenges in trying to obtain capital. A recent study by Babson College in fact finds in many cases small businesses receive less than 50% of the amount they asked for. The same survey found small businesses seeking funding through credit cards had the most reliable success rate (93%), online lenders were next (80%) and banks came in lower at about 65%. Over the long term, receiving only partial funding could significantly stymie small business operations and growth. Further, the rankings show at least this group of small businesses surveyed show banks may also run the risk of customers walking away dissatisfied and disgruntled at some level. It bodes well for our industry that banks are the main source for small business credit. Indeed, survey respondents indicated they were about 400% more likely to apply to banks for capital than any other source. Moreover, small business owners remain reliant on their existing banking relationships to obtain future credit. However, banks won't necessarily be able to maintain this dominance in the future without expending additional effort. As the survey noted, nontraditional sources of capital such as online lending and crowdfunding, are emerging as financing alternatives for small businesses. Indeed, 13% of all survey respondents said they applied for capital using these sources. Notably, younger companies under 12Ys old were more likely to leverage family and friends, angels, factoring and online lending than were the older businesses. This speaks volumes to the potential of these emerging funding sources as nascent companies age. To better serve small businesses, banks have multiple options. When asked what would make it easier to access credit or obtain loans, the majority of respondents (58%) said they wanted more flexible terms from their lenders. Nearly half the business owners (46%) also called for smaller minimum loans and 44% said banks should do more to reduce the amount of paperwork. Certainly there are regulatory constraints that limit some of these areas, but banks can work within any confines to ease the burden on small business customers. What's more, by educating businesses owners on the variety of lending models, financing products available, rates and terms; banks can open new doors for customers. Certainly, informed consumers make better customers in the long run. Despite all of the challenges out there, small businesses continue to rely on banks to quench their thirst for much-needed funds as they grow and expand operations. Community bankers know that by offering their help, today's makeshift lemonade stands can become tomorrow's long-lasting and thriving businesses. Ignore the cranky neighbors and keep doing what you do community bankers as you support small business all over this great country of ours. Yields dropped 5bp as volatility continued and global growth concerns increased. The Financial Times reports discussions with M&A investment bankers' finds their clients have paused on many planned deals. Reasons cited were trying to fully understand the potential impact of the Brexit and uncertainty over US presidential elections in Nov.
Bankers have seen their equity prices get hit hard following the Brexit as the impact of low yields (and lower NIM) weighs on investor sentiment. Look for banks to increase stock buybacks and increase dividends as ways to offset the negativism. 1) German banking software company Wirecard AG will acquire the institutional prepaid card business of Citigroup for an undisclosed sum. This prepaid card unit has more than 2,500 prepaid card programs. BancorpSouth Bank ($13.9B, MS) will pay $10.6mm to settle CFPB claims it discriminated in mortgage lending practices that harmed minorities. The CFPB reportedly had an audio recording that captured an internal meeting where officials articulate a policy that discriminated against minorities. A study by Wells Fargo finds 80% of millennials who own businesses intend to grow them over many years, but less than 50% said they were knowledgeable about handling their business finances. Perhaps this is an opportunity for community bankers to ramp up outbound training and communications with these business owners.